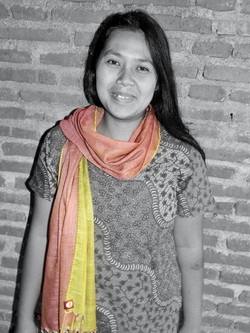 Ayu sewing project was designed to fill a need in the lives of low income women in East Java. Working for Ayu gives them an opportunity to earn an income while staying at home with their families. It started with scarves being sewn by hand and has progressed to the point that each member now has their own sewing machine that they have learned to sew on, which has allowed for more creativity and new products! Now, they all are able to sew table runners, place mats, tote bags, aprons, purses,make-up bags and even quilts, in addition to scarves. Their inspiration comes from their desire to provide a better life for their families. As you read through each of the women's stories, please know they appreciate your support!! Eka is a wonderful mother of three boys ages 9, 7 and 6. Her husband now works with our local international school, which has been a great blessing to their family . Eka is quiet and stays at her house with the boys the majority of the time, but once you get her away from the house, she comes alive. She is funny and incredibly sweet with an extremely likable personality. She's doing really well with her hands as full as they are with her active little guys. Eka is a leader and is able to train other women in their sewing. Eka continues to do very well in her sewing and has even taught herself how to sew clothes for herself and her family. This picture represents Titiek very well. She is so much fun to be around and keeps the party going. Titiek and her husband have begun their own business grounding and selling corn which now takes up a lot of their time. Titiek has one daughter who is 10 years old and is in the third grade. Titiek is awesome. If you need something done and done well, she's your girl, and will keep you laughing. Nirma has her hands full with taking care of her family and running the small store in front of her house. She stays at home with her three daughter ages 12, 8 and 4 and she also sews uniforms for the local schools in her neighborhood. 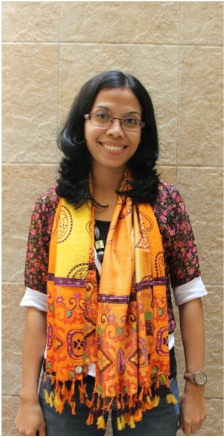 Nirma was the only Ayu member with a little experience in sewing but had never hand sewn before. 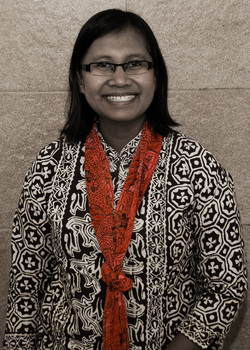 Nirma is passionate about what she believes in and has a soft and likable spirit. 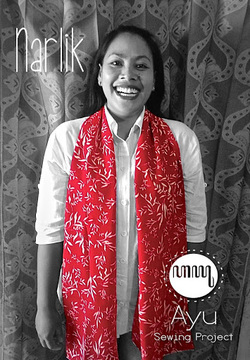 Nirma is a leader of one of the 3 groups and also trains new ladies that join Ayu sewing project. She has a heart and a passion for serving the women of Ayu. 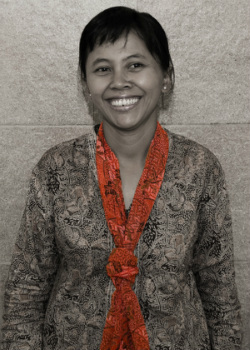 Yuyun is Titiek's sister and also is a mother of a 10 year old boy. She stays home while her husband builds houses nearby. She is very much like her sister in that she is a go-getter. She had a beautiful skill from the very beginning. Her first scarf was very impressive and looked as if she had been doing it for years! She is a hard and diligent worker who settles for only the best. Her smile is contagious and you rarely see her without it. Sunarlik has been a part of our group for about two years. She began sewing for us in the fall of 2015. She is a wonderfully sweet, outgoing, and precious lady, with an engaging smile and heart to match. She has two children, one in elementary school and one in Junior High. Her husband works as a local farmer, so she needs extra income to help put her children through school. She is a hard worker, and has been a joy to the others in the group. Susi lost her husband in 2014 from kidney disease, leaving her with a three year old daughter and no way to provide for her. She is now remarried and has a little boy who is full of energy and a joy to be around. The sewing project continues to allow her to receive an income while caring for her family. She has used the income to put a real bathroom in her home, buy a washing machine and a refrigerator! These are all firsts for her and her family! Susi has developed a passion for sewing and creating things on the sewing machine so she is in the process of creating her own products to sell! Siti is 28 years old, the sister of Susi pictured above. She is the mother of 2 children, a boy and new baby girl. Siti is a very conscientious worker. She tends to be more introverted, but is always kind, agreeable, and personable. She enjoys meeting with the others and listening to all that is said around her. Ju is the mother of 3 children and 1 grandchild. Unfortunately, her husband had a bad motorcycle accident a few years ago and was seriously injured. He struggles to work full time now. Despite this turn in her life events, Ju is very gracious and grateful for the blessings in her life. She is very sweet and has a wonderful and helpful spirit. Ju is now a leader of one of the groups. She is a strong leader and mother figure to all of them. 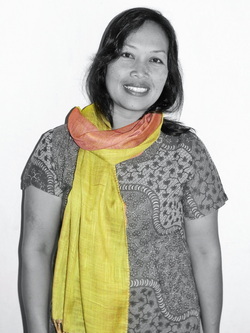 Suci is the mother of three children. One of them is in elementary school, one is in high school and one is out of school. She is very quiet but has a wonderfully sweet disposition. You can't help but like her! She is very grateful for this opportunity to improve her family's life and has proven to be very responsible and hard working. She is very proficient with sewing machine and had been able to train the other women in their skills as well. 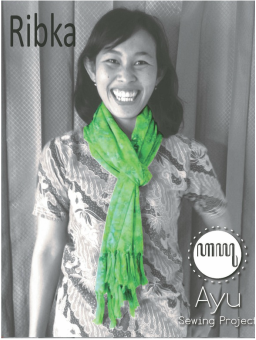 Ibu Rifka is a new member of Ayu Sewing Project and began with us in March of 2016. She has a beautiful personality and has been a great encouragement to the other women in the group. She is married and has one little girl. Rifka's first child tragically and unexpectedly passed away due to a brain tumor at the age of 3. But the following year, she was blessed with another little girl who was born at the exact time and date that her first child passed away! Her second little girl is now 4 years old and healthy. Her husband doesn’t make much money so she wants to help provide for her family by sewing with Ayu. She is a hard worker and we are blessed to have her as a part of our group. 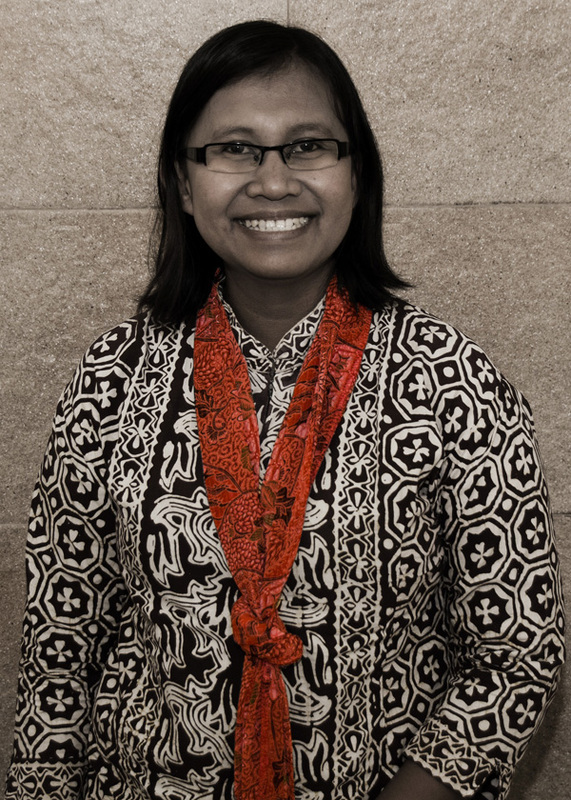 Ibu Sutiar has recently joined the sewing group, and began in June of 2016. She is very sweet, outgoing, and a hard worker. She used to make plastic shopping bags for a local factory out of her home and was paid very little, but since working for Ayu does not need to make the baskets anymore. Her husband works for the government but continues to have back troubles and is in and out of work. She is grateful to be able to sew these beautiful products to help provide for her family. 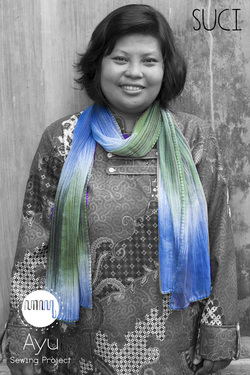 ​Bu Ika is one of the newest members of Ayu Sewing Project. She has such a sweet, loving personality, and is always caring for other people. She is a lovely lady with a precious heart, a hard worker and loves her family. Bu Ika and her husband have just opened a small barber shop, so she needs the Ayu Sewing Project income to be their source of steady income while they are building their barber shop business. Nova began working for us in September of 2014. 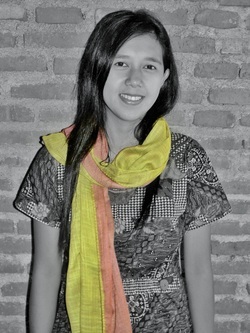 She is the administrative assistant for Ayu Sewing Project. She helps do anything and everything that is needed to make this business work, including marketing, accounting, interactions with our ladies, and website design. She is a wonderful lady, full of enthusiasm, joy, and a love for life. She loves people and is a wonderful asset to this business as she engages our workers and shares in their lives. Nova is now married and has a precious baby boy.